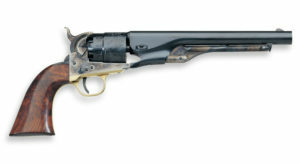 Far into the war the Confederate Government was forced to appeal to the sense of patriotism of anyone who could contribute in the production of guns. Mr. Griswold answered to this help request. The gun production of the Griswold & Grier was soon stopped by the lack of steel: church bells, sword handles and cannon parts were used. 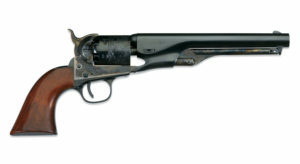 Thus originated the Reb Confederate revolver based on the original Colt Model 1851 Navy. Main differences are round barrel and red or yellow cast brass frame, brass triggerguard and backstrap of the same color of the frame. Made by F.A.P. di PIETTA Giuseppe & C. Srl.